We close 2 weeks from today! We have approxamately 359,058 plans for this house. I’m gonna try my best to give you a peek at our ‘phase 1’ plans. There will be a ‘phase 2’ that will basically be us doing an overhaul of the bathrooms and the kitchen. 2 things that will be happening throughout the whole house: All trim and walls will be painted. This is a listing photo so it’s a little crappy. This tile runs into part of the dining room. 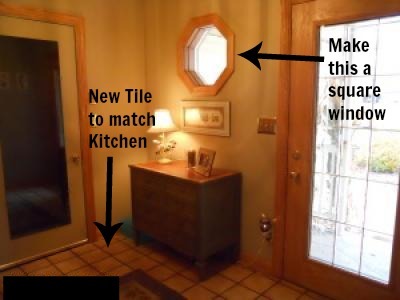 I want to switch the tile and run it into the kitchen and make the entire dining room hardwood. You can see how the tile extends into part of the dining room in this pic. Don’t ask me what the thought process was behind that. Eventually, we’ll replace the countertops, the backsplash and switch the fridge and the pantry. This is the EXACT tile I want for the kitchen and entry, laid in this exact pattern. I want black counters but instead of penny backsplash, I want subway tile. See how the other half of the dining room has wood floors? I really want to carry the wood all the way to the wall by the stairs. I’d also like them to be DARK wood floors. We get a lot of mixed feelings about walling up the little space between the dining room and the lower level. My main reason: noise control. This house is sooooo open. I’d like to go to bed if I want to and not have to hear H and his buddies hooting and hollering at the TV. Also, EVENTUALLY, we’ll have kids, and I will murder anyone that disturbs their sleep. Andplusalso, all of those spindles kind of remind me of jail. Tomorrow I’ll bore you with the details of the other floors. I can’t wait to take you guys on a tour when we move it!